(2016) "A Head Full of Dreams"
"Up & Up" (stylised as "Up&Up") is a song by British rock band Coldplay from their seventh studio album, A Head Full of Dreams (2015). It was released as the third single of the record on 22 April 2016 by Parlophone. Background vocals in the song are provided by Beyoncé, Annabelle Wallis and Merry Clayton. A music video for the track, directed by Vania Heymann, was released on 16 May 2016. The song contains a chorus choir, which featured nearly all the artists who have collaborated with the group, including Beyoncé, Brian Eno and the children and guests of the four musicians. Guitarist and singer Noel Gallagher also contributed, performing the song's second guitar solo, which was omitted in the radio edit. The music video makes extensive use of impossible imagery, including a scene where dolphins swim in a sea situated underneath an inverted landmass (pictured). The band had released teasers on their social media accounts leading up to the video release. The music video directed by Vania Heymann and Gal Muggia was released on 16 May 2016. It has been described on the band's website as a "poignant, surrealist montage which alludes to contemporary issues." The video itself consists of over-layered visuals, and has the band playing the song in various landscapes and locations. One of the locations used is the Croatian mountain range of Biokovo, upon which Chris Martin appears to be seated. Scenes and visual effects for the video were created by GloriaFX, a Ukraine-based visual effects company, headed by Anatolii Kuzmytskyi in Ukraine and by Max Colt in the US. Martin called it "one of the best videos ever made". Some scenes were cut from the video to make it shorter, including a man with a volcano in place of his head. Billboard magazine's Chris Payne described the music video as "appropriately epic" with "a heady, shoot-for-the-stars type of statement". Carl Williott of Idolator, who was reserved towards the song itself, felt that its video "elevates it thanks to some artfully trippy visuals". MTV UK called the video "weird and wonderful in every respect" and "magical yet poignant". The video received nominations for Best Direction and Best Visual Effects at the 2016 MTV Video Music Awards, winning the latter. The music video was also nominated for the Grammy Award for Best Music Video at the 59th Annual Grammy Awards. After giving fans a live performance preview of the album on 21 November 2015 in Los Angeles, Martin said: "This is kind of the song we've been waiting to write for 15 years." The band performed the song at the Super Bowl 50 halftime show held on 7 February 2016 in Santa Clara, California. They were joined by Bruno Mars and Beyoncé while singing the last verses. During the performance at Glastonbury Festival on 26 June 2016, the band were joined on stage by Chris Martin's children, Apple and Moses, who helped with the backing vocals. Credits are adapted from A Head Full of Dreams liner notes. ^ "#UpAndUp". Instagram.com. Coldplay. Retrieved 17 May 2016. ^ "Watch the new Up&Up video". Coldplay.com. Coldplay. Retrieved 17 May 2016. ^ Harča, Vedran (24 May 2016). "Chris Martin tijelom 'prekrio' Biokovo: Hrvatska u novom spotu Coldplaya" (in Croatian). Vijesti.hr. Retrieved 1 June 2016. ^ "Chris Martin comments the Up&Up video". ^ Payne, Chris (16 May 2016). "Coldplay Shares Otherworldly 'Up & Up' Video". Billboard. Retrieved 1 June 2016. ^ a b Williot, Carl (16 May 2016). "Coldplay's "Up & Up" Video Elevates The Song: Watch". Idolator. Retrieved 1 June 2016. ^ "Please take a moment out of your day to watch Coldplay's Up&Up music video". MTV UK. Retrieved 17 May 2016. ^ "2017 Grammy nominations: complete list, top nominee Beyoncé could make history". Los Angeles Times. 6 December 2016. Retrieved 6 December 2016. ^ "Coldplay perform new songs 'Up&Up' & 'A Head Full Of Dreams' at LA gig - watch". NME.com. NME. Retrieved 17 May 2016. ^ Lynch, Joe (7 February 2016). "Coldplay Brings Beyonce, Bruno Mars & History to Color-Drenched Super Bowl 50 Halftime Show". Billboard. Retrieved 1 June 2016. ^ "Gwyneth Paltrow watches Coldplay headline Glastonbury". Retrieved 31 October 2018. ^ "Up&Up (Radio Edit) - Single by Coldplay on Apple Music". iTunes. Retrieved 25 February 2017. ^ "Up&Up (Freedo Remix) - Single by Coldplay on Apple Music". iTunes. Retrieved 25 February 2017. ^ "Top 20 Argentina – Del 6 al 12 de Junio, 2016" (in Spanish). Monitor Latino. 6 June 2016. Retrieved 1 May 2017. ^ "CHART WATCH #375". auspOp. 2 July 2016. Retrieved 2 July 2016. ^ "Austriancharts.at – Coldplay – Up&Up" (in German). Ö3 Austria Top 40. Retrieved 20 October 2016. ^ "Ultratop.be – Coldplay – Up&Up" (in Dutch). Ultratop 50. Retrieved 17 June 2016. ^ "Ultratop.be – Coldplay – Up&Up" (in French). Ultratip. Retrieved 16 July 2016. ^ "ČNS IFPI" (in Czech). Hitparáda – Radio Top 100 Oficiální. IFPI Czech Republic. Note: Change the chart to CZ – RADIO – TOP 100 and insert 201626 into search. Retrieved 4 July 2016. ^ "Lescharts.com – Coldplay – Up&Up" (in French). Les classement single. Retrieved 8 June 2016. ^ "Offiziellecharts.de – Coldplay – Up&Up". GfK Entertainment Charts. Retrieved 8 July 2016. ^ "Coldplay Chart History". RÚV. Retrieved 19 June 2017. ^ "Chart Track: Week 22, 2016". Irish Singles Chart. Retrieved 4 June 2016. ^ "מדיה פורסט - לדעת שאתה באוויר". Mediaforest.biz. Archived from the original on 30 June 2016. Retrieved 28 May 2016. 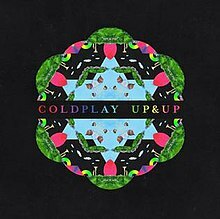 ^ "Italiancharts.com – Coldplay – Up&Up". Top Digital Download. Retrieved 10 July 2016. ^ "Dutchcharts.nl – Coldplay – Up&Up" (in Dutch). Single Top 100. Retrieved 1 July 2016. ^ "Listy bestsellerów, wyróżnienia :: Związek Producentów Audio-Video". Polish Airplay Top 100. Retrieved 20 June 2016. ^ "Portuguesecharts.com – Coldplay – Up&Up". AFP Top 100 Singles. Retrieved 20 July 2016. ^ "SloTop50 – Slovenian official singles chart". slotop50.si. Retrieved 28 August 2018. ^ "Swisscharts.com – Coldplay – Up&Up". Swiss Singles Chart. Retrieved 19 June 2016. ^ "Official Singles Chart Top 100". Official Charts Company. Retrieved 1 July 2016. ^ "Coldplay Chart History (Hot Rock Songs)". Billboard. Retrieved 14 August 2016. ^ "Coldplay Chart History (Adult Alternative Songs)". Billboard. Retrieved 14 August 2016. ^ "Coldplay Chart History (Alternative Songs)". Billboard. Retrieved 6 August 2016. ^ "Coldplay Chart History (Rock Airplay)". Billboard. Retrieved 6 August 2016. ^ "Top 100 Anual 2016". Monitor Latino. Archived from the original on 22 August 2017. Retrieved 21 August 2017. ^ "Classifiche "Top of the Music" 2016 FIMI-GfK: La musica italiana in vetta negli album e nei singoli digitali" (Click on Scarica allegato to download the zipped file containing the year-end chart PDF documents) (in Italian). Federazione Industria Musicale Italiana. Retrieved 23 February 2017. ^ "Hot Rock Songs – Year-End 2016". Billboard. Retrieved 5 January 2018. ^ "Adult Alternative Songs – Year-End 2016". Billboard. Retrieved 5 January 2018. ^ "Irish single certifications – Coldplay – Up&Up". Irish Recorded Music Association. Retrieved 18 December 2017. ^ "Italian single certifications – Coldplay – Up&Up" (in Italian). Federazione Industria Musicale Italiana. Retrieved 30 May 2017. Select "2017" in the "Anno" drop-down menu. Select "Up&Up" in the "Filtra" field. Select "Singoli online" under "Sezione". ^ "Polish single certifications – Coldplay – Up & Up" (in Polish). Polish Society of the Phonographic Industry. Retrieved 16 November 2016. ^ "British single certifications – Coldplay – Up & Up". British Phonographic Industry. Retrieved 18 May 2018. Select singles in the Format field. Select Silver in the Certification field. Type Up & Up in the "Search BPI Awards" field and then press Enter. ^ "BBC – Radio 1 – Playlist". BBC Radio 1. 22 April 2016. Archived from the original on 25 April 2016. Retrieved 28 April 2016.